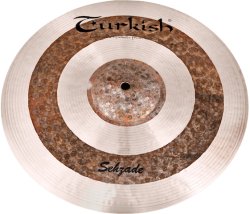 The Sehzade series is one of our most adventurous offerings. Its underside is lathed &heavily hammered. The upper surface is a combination of lathed & unlathed hammered circles. The large, high-profile bell is unlathed. The appearance is like leopard skin. 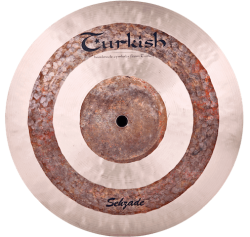 The effect of the lathed and unlathed surface is what makes this cymbal so special. 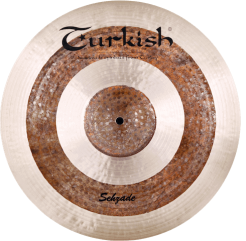 Hit the outer lathed surface, and the cymbal produces a spicy, dark ride sound with lots of energy. 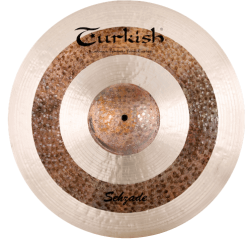 When the drum stick is moved to the unlathed section, the sound dries out, giving greater stick definition. The unlathed bell is dry & clear.